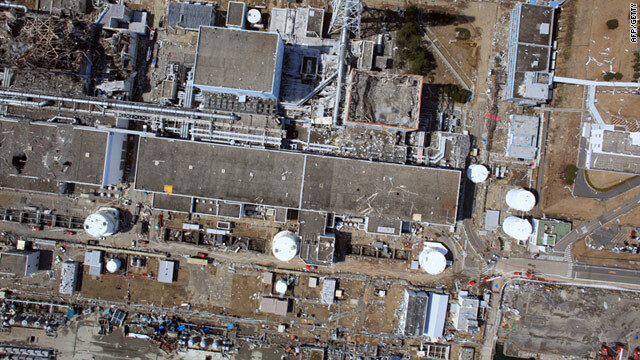 Q&A: Is Fukushima as bad as Chernobyl? The severity rating of the Fukushima Daiichi nuclear power plant disaster has been upgraded to level 7. (CNN) -- Japan raised the severity level of its nuclear crisis to the maximum level seven on Tuesday, putting the Fukushima Daiichi power plant disaster on a par with the Chernobyl accident in 1986. The decision to raise the crisis level up from five to seven came after a review of the amount of radiation released in the month since the plant was severely damaged by the earthquake and subsequent tsunami, says Japan's official nuclear watchdog, the Nuclear and Industrial Safety Agency (NISA). Level seven on the International Nuclear Event Scale (INES) incidents involve a major release of radiation with widespread health and environmental effects, according to the International Atomic Energy Agency (IAEA). Fukushima remains in a dangerous state -- as the northeast of Japan suffers numerous aftershocks, engineers and technicians are still battling to restore the plant's cooling systems, says owner Tokyo Electric Power Company (Tepco). Chief Cabinet Secretary Yukio Edano, the Japanese government's leading spokesman on the crisis, said on Tuesday: "The change in the level reminds us the accident is very big. I apologize to the residents of the area, the people of Japan and the international community." Does the change to level 7 have any immediate consequences? No, according to nuclear experts, who say the change in level is a reassessment of the month-long disaster rather than a reaction to a recent event at the plant. Professor Francis Livens, Research Director of the Dalton Nuclear Institute in Manchester, England, said: "They have taken stock, they have got to the point where they have some level of stability and enough time has passed for them to evaluate the full impact of the disaster." Is the upgrade to level 7 justified? The disaster was classified as a level 5 accident on March 18 says NISA. The environmental pressure group Greenpeace argues that the level should have been upgraded to level 7 in late March, while others are more cautious. Thomas Breuer, Head of the Climate and Energy Unit at Greenpeace, said in a written statement: "The (nuclear) industry both inside and outside Japan have again been underplaying the human consequences of this terrible tragedy, and only now after a month has this disaster been accepted for what it is - the worst on its scale." Livens says that technically Fukushima is a level-seven incident, although he added that in his opinion Fukushima was a "low-level seven," while Chernobyl was at the upper end of the scale. "Fukushima is a very, very serious incident but Chernobyl was a catastrophe," Livens added. The INES scale was formulated by scientists for the IAEA, the United Nation's nuclear watchdog, as a way of identifying the severity of incidents involving nuclear energy. Like the Richter scale used to measure earthquakes, the INES scale attempts to grade nuclear disasters on their potential impact. There are seven scales: Levels 1 to 3 are called "incidents" while levels 4 to 7 are called "accidents." Level 1 is an "anomaly," 2 is an "incident," and level 3 is a "serious incident." Level 4 is an accident with "local consequences," 5 is an accident with "wider consequences," 6 is a "serious accident." Level 7 is: "A major release of radioactive material with widespread health and environmental effects requiring implementation of planned and extended countermeasures," according to the IAEA. What scale have other nuclear disasters been rated at? 1957: An explosion in the waste tank at Kyshtym, Russia, was rated as a level 6 accident. 1979: The Three Mile Island incident in Pennsylvania was classified a category 5. 1957: Windscale in the UK in 1957 was also classified as a category 5. 1999: Tokaimura, Japan,1999, level 4, caused by workers breaking safety regulations by mixing dangerously large amounts of treated uranium. 1993: Seversk, Russia: Level 4. Tank inside the plant explodes while being cleaned. So, is Fukushima really as bad as Chernobyl? Fukushima and Chernobyl are the only two nuclear accidents to be rated at level 7. However, the Japanese and many experts are keen to point out key differences between the two incidents. According to the IAEA, at Chernobyl in the Ukraine (then part of the Soviet Union) a combination of operator error, reactor design error and a lack of safety culture caused the reactor core to explode, releasing a huge amount of radioactive material into the atmosphere in a very short space of time. This resulted in the permanent evacuation of a 30-km radius around the plant. There were 32 deaths among plant workers and firefighters, mostly due to radiation exposure, and the IAEA estimates another 4,000 will or have died of related cancers. Although Fukushima experienced a relatively small hydrogen explosion at reactor No. 1, the reactors are largely intact and overall there has been a smaller leak of radiation over a longer period of time. NISA on Tuesday said they now estimate that the Fukushima plant's reactors released up to 10,000 terabecquerels of radioactive iodine-131 per hour into the air for several hours after they were seriously damaged on March 11. And they estimate that up to 630,000 terabequerels has been estimated at the stricken plant which would classify the crisis at level 7. In comparison the Japanese government said the release from Chernobyl was 5.2 million terabecquerels. Hidehiko Nishiyama, the chief spokesman for NISA said the amount of radiation released is a tenth of what was released at Chernobyl. Livens said: "Less radiation has been released and as a vague calculation it is 5 or 10% of that released at Chernobyl." Another difference between Fukushima and Chernobyl is that the Ukrainian plant had a higher density of people living near it. According to Malcolm Grimston, Associate Fellow for Energy, Environment and Development at London's Chatham House, the single biggest issue following the Chernobyl disaster was radioactive iodine getting into the thyroid gland and causing cancer. "At Chernobyl they had trouble getting hold of these tablets because it was such a poor area," he said. Edano said: "What's different here from the Chernobyl accident is that we have not yet seen a direct impact on the health of the people as a result of the nuclear accident. The accident itself is big, but we will make, as our first priority, our utmost effort to avoid any health impact on the people." Japanese authorities were quick to distribute iodide tablets to people living near Fukushima. In the context of nuclear energy, it is ionizing radiation that is referred to, which passes through matter causing it to become electrically charged or ionized. In living tissues, the electrical ions produced by radiation can affect normal biological processes.